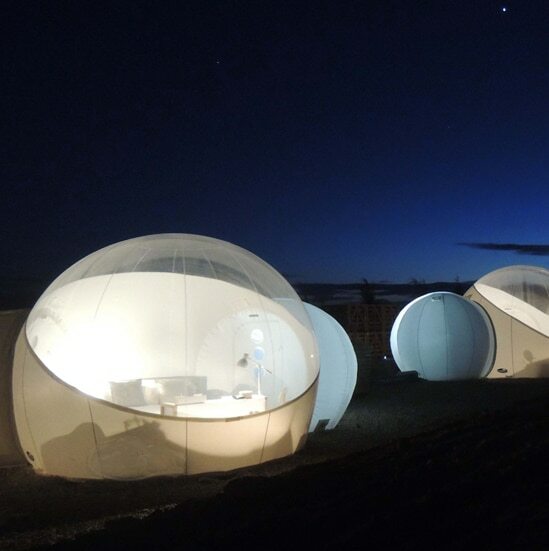 Original Glamping has selected the bubble camps. Bubble’s concept is based on the following lines: minimum energy, and minimum material for a maximum comfort and maximum interaction with the environment.Made from recyclable material, the Bubbles are inflated by a silent turbine renewing, filtering and correcting the humidity level of the air. Our Bubbles have brought the travelers beyond the familiar experiences of deluxe accommodation to enjoy a new form of well-being in the closest proximity to flora and fauna.